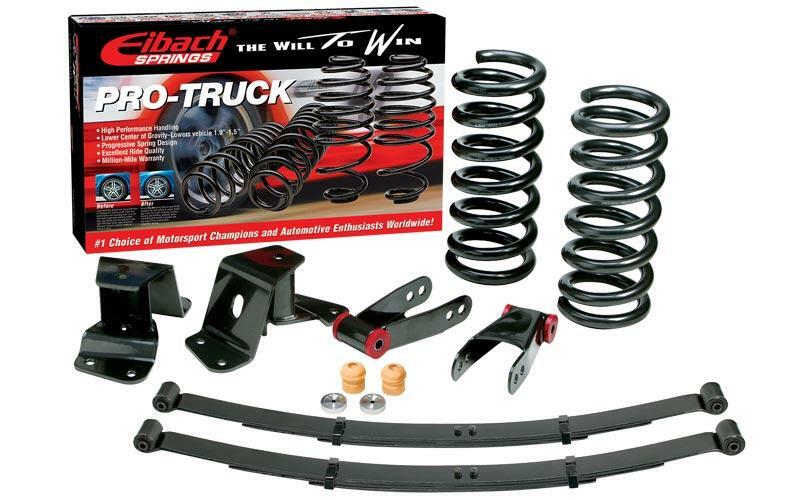 Eibach PRO-TRUCK lowering kits are carefully designed to lower the center of mass of todays most popular trucks and SUVs, improving handling, increasing safety and enhancing appearance all at the same time. Like every Eibach Performance Spring Package, our PRO-TRUCK sport lowering kits are the perfect complement to increasingly popular large-diameter wheel-and-tire packages. Precisely engineered and manufactured Eibach PRO-TRUCK lowering components deliver superior handling, improved aerodynamics, enhanced transient response and rugged durability all while maintaining the smooth, compliant ride for which Eibach is famous. And unlike many competitors products, Eibach PRO-TRUCK kits never require addon retaining straps to keep your springs in place! To maximize the performance of your Eibach PRO-TRUCK suspension upgrade, compliment them with our top quality PRO-TRUCK-SHOCKS available for select applications of Cadillac, Chevrolet, GMC, Dodge and Ford Trucks and SUVs.